One of the many convenient features we appreciated in the Whirlpool WFW94HEAW is the digital countdown display that shows you exactly how much time left you have on the cycle. 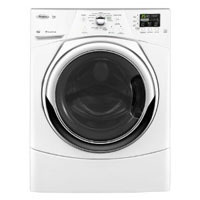 This Whirlpool has many other handy features that justify its slightly higher price. For instance, with 12 cycles, you can be certain that everything you own—from bulky comforters and jackets to delicate items—will be thoroughly cleaned in the 4.3 cubic foot drum. The machine also boasts smart temperature controls that reduce the risk of shrinking your clothes or making the colors bleed into each other. We were impressed with the Whirlpool’s overall performance and recommend it for large households.